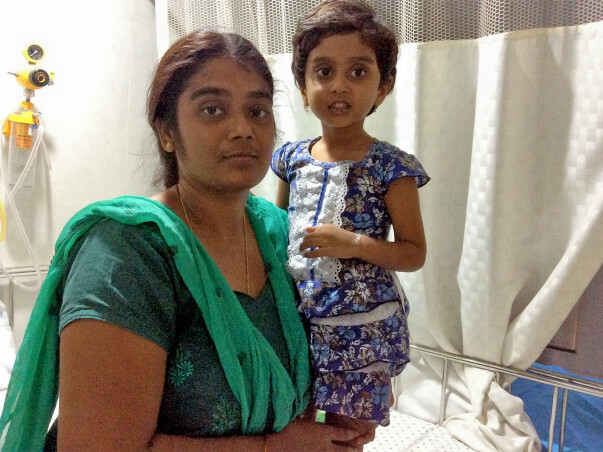 4-year-old Kanganna was diagnosed with blood cancer just 2 months ago. Her father is a photographer and mother is a housewife. Kanganna was taken to various hospital and was finally brought to Child Trust Hospital, Chennai. She is on chemotherapy but lack of funds has put her life in danger. 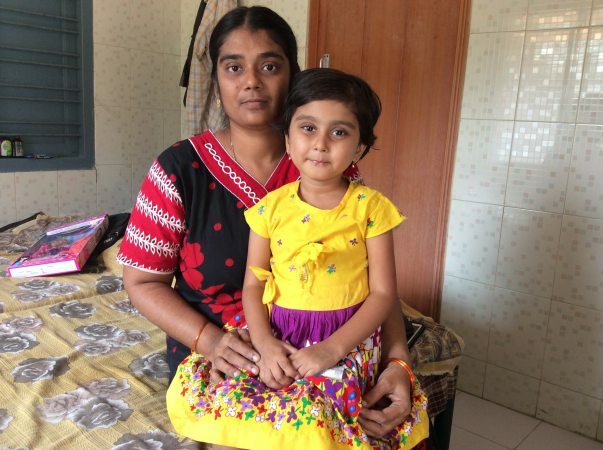 It was with much difficulty that Hari, Kanganna's father, arranged for funds to treat her so far but they nothing left to pay for her next session of chemotherapy. 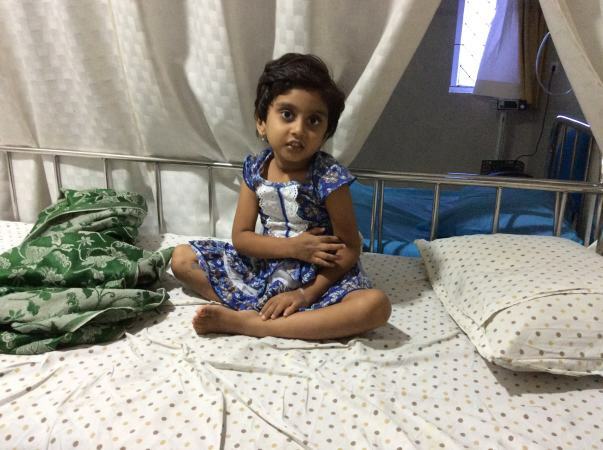 Hari and Bhanu belong to different religions and this has denied help for this little girl. Since their marriage, relatives has distanced themselves. With no support from the relatives, Hari and Bhanu are struggling to find another source to arrange funds. Our support will save the life of this 4-year-old. This is Haritha, a fellow based at Chennai. I recently had a chance to speak with Kangana’s doctor and we have good news to share with you. “Kangana recently started off with her chemo sessions and she has been responding very well” says Dr. Aarthi Srinivasan. I am Uthra Nagarajan, an Open Fellow with Milaap. I had the opportunity to meet 4-year-old Kanganna and her family at their rented stay in Royapettah, Chennai. Playing with the sand outside when I arrived, Kanganna dashed in and hid behind her mother. Well-cared for by her mother, father, and grandmother, Kanganna is undergoing chemotherapy treatment. “It has been a month since the sessions started. Chemo sessions are twice a week - on Tuesdays and Fridays.” said Bhanu, Kanganna’s mother. The family will reside in Chennai for at least nine more months to complete the treatment plan. After that, fortnightly or monthly sessions will take over. The family spends Rs 2,500 for accommodation and some more for food from outside, as they can’t cook. “But we have requested for a room with a kitchen and we will get it soon,” explained Bhanu. 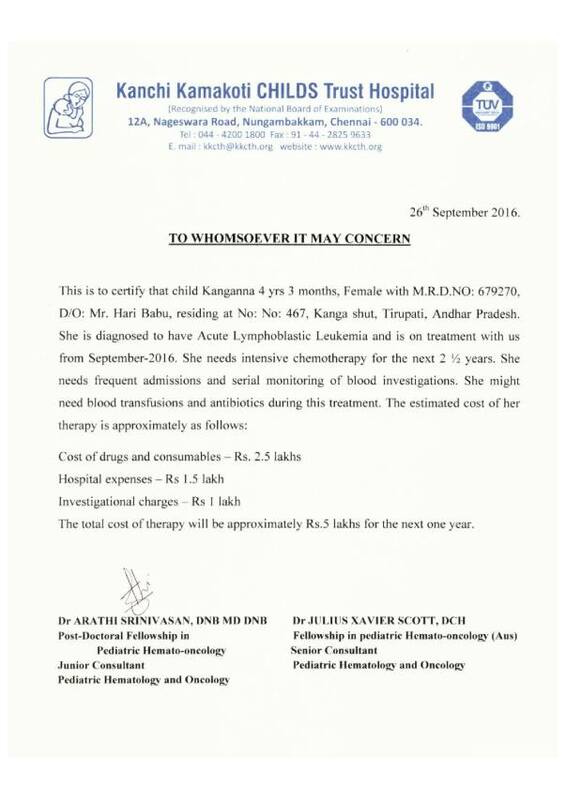 Kanganna’s parents have spent around Rs 1.5 lakh until now for her treatment and are hopeful of a speedy recovery.